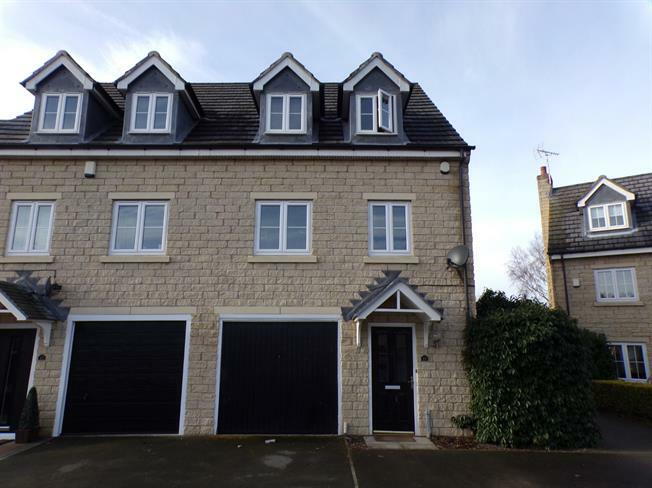 3 Bedroom Semi Detached House For Sale in Mansfield for Offers Over £165,000. IDEAL FOR FAMILIES AND FIRST TIME BUYERS! Bairstow Eves are delighted to welcome this modern end town house to the market which is a rare opportunity to acquire a property on this street. The property is to be sold with no upward chain and viewings are strongly recommended to appreciate the size of this property throughout. The ground floor comprising a spacious entrance hall with access to the single integral garage and w/c under the stairs. To the rear of the property on the ground floor there is a magnificent, modern fitted kitchen diner with french doors opening out onto the enclosed rear garden. The first floor benefits from the spacious living room which spans the full width of the property and also looks over the garden. The first floor landing also gives access to the stunning master bedroom which benefits from an en-suite shower room. To the second floor there are then a further two double bedrooms as well as the family bathroom suite. Additionally the property has gas central heating, double glazed windows throughout, off road parking, integral garage and an enclosed rear garden to the rear. Viewings are strongly recommended as property on this street don't usually last very long so please call the office for viewing arrangements. UPVC French double glazed door, opening onto the garden. Double glazed uPVC window facing the rear overlooking the garden. Radiator, tiled flooring, ceiling light. Roll top work surface, fitted, wall and base and drawer units, belfast style sink, integrated, electric oven, integrated, gas hob, over hob extractor, space for washing machine, fridge/freezer. Double glazed uPVC window with frosted glass. Radiator, ceiling light. Low level WC, pedestal sink. UPVC French double glazed door, opening onto the garden. Double glazed uPVC window facing the rear overlooking the garden. Radiator, carpeted flooring, ceiling light. Radiator, ceiling light. Low level WC, single enclosure shower, pedestal sink, extractor fan. Double glazed uPVC window with frosted glass facing the rear overlooking the garden. Radiator, ceiling light. Low level WC, roll top bath with mixer tap, pedestal sink with mixer tap, extractor fan.